Dark matter is the term astronomers use to describe material in the universe that does not emit or reflect light and is, therefore, invisible. Stars, nebulae, and galaxies are examples of luminous objects in the sky. However, luminous matter appears to make up only a small fraction of all the matter in the universe, perhaps only up to 10 percent. The rest of the matter is cold and dark, hidden from people's direct view. The principal way dark matter can be detected is by observing its gravitational effect on nearby objects. Although dark matter does not shine, it still exerts a gravitational force on the matter around it. Astronomers believe that dark matter is a "cosmic glue" holding together rapidly spinning galaxies and controlling the rate at which the universe expands. How can we know what we cannot see? Understanding something that cannot be seen is difficult, but it is not impossible. Present-day astronomers study dark matter by its effects on the bright matter that can be observed. It was in the 1930s that Swiss astronomer Fritz Zwicky first pointed out that dark matter must exist. Zwicky claimed that the mass of known matter in galaxies is not great enough to generate the gravitational force to hold a cluster of galaxies together. Each independent galaxy moves at too great a speed for galaxies to remain in a cluster. Yet the galaxies were not spinning away from each other. They had to be held together by a gravitational field created by undetected mass. More than 40 years later, American astronomer Vera Rubin found that the same principle is true within a single galaxy. The mass of stars alone do not exert enough gravitational pull to hold the galaxy together. She discovered that stars in the far reaches of the galaxy rotate about the galactic center at the same speed as stars close to the center. Rubin concluded that some invisible, massive substance surrounds a galaxy, exerting gravitational force on all its stars. Black dwarf: Remains of a white dwarf star that has stopped glowing. Brown dwarf: Blob of celestial gas not massive and hot enough to trigger the nuclear reaction at its core that would classify it as a star. Subatomic particle: Basic unit of matter and energy smaller than an atom. White dwarf: Dense, faintly glowing core left when a medium-sized star stops burning. Astronomers have only been able to speculate on the composition of dark matter. One source of dark matter might be the diffuse, dark "halo" of gas in and around galaxies that increases their mass. 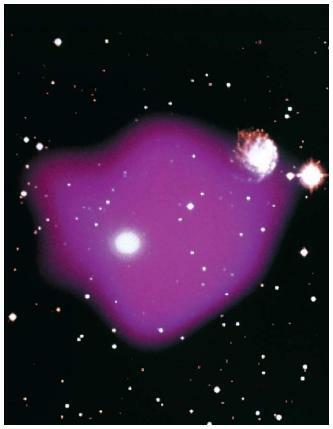 Another might be dark objects called MACHOs (MAssive Compact Halo Objects) that lurk invisibly in the halos surrounding galaxies and galactic clusters. MACHOs are planets or stars made up of ordinary matter that are too faint to be observed directly. However, they can act as a gravitational lens and magnify the brightness of brighter stars behind them. Astronomers have also considered that dark matter may be supermassive black holes (single points of infinite mass and gravity formed from the collapse of burned-out massive stars) at the centers of galaxies. These black holes may be contributing several hundred million or even a billion solar masses to the galaxies in which they reside. One more possible source of dark matter could be multitudes of WIMPs (Weakly Interacting Massive Particles), exotic, unfamiliar particles that may exist all around us. Astronomers have theorized about the existence of these particles, although experiments have not yet confirmed their presence. The search for the truth about dark matter is inextricably tied in with other outstanding questions in cosmology: How much mass does the universe contain? How did galaxies form? Will the universe expand forever? Dark matter is so important to the understanding of the size, shape, and ultimate fate of the universe that the search for it will very likely dominate astronomy until an answer is found.